I’m weary when I read that a recipe is healthy – “high in protein, gluten-free, and it can even be sugar-free!” but I loved the concept and the thinking behind it seemed logical. It uses white beans as a base, which I have done for many savory dips, and there is no butter, flour, or eggs. It couldn’t be easier; you put all the ingredients (except the chocolate chips) in to a food processor and blend till smooth. You can add more oatmeal if the mixture is not thick enough or more milk if you need to thin it out. I would recommend rinsing the beans really well after draining to remove more of the starchy taste. I served them with cinnamon & sugar pita chips initially, but I think that made the whole experience overly sweet. 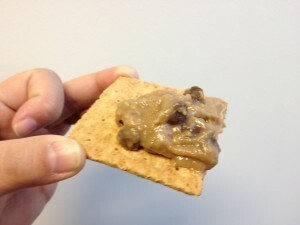 I switched to graham crackers and that balanced the sweetness successfully. Enjoy! See the following link for: Sugar-Free Version. Sweetener Notes: I used 2/3 cup brown sugar when I first made this for the party. Liquid sweeteners (agave, maple, etc.) are fine as well, as is evaporated cane juice. You can easily get away with less sugar– some people will be perfectly fine with just 3 tbsp for the whole recipe! And if you don’t want any sugar, be sure to check out the “no-sugar” version linked above.